PlayFall Rubber Playground Safety Surfacing is designed to meet the stringent ASTM requirements for playground fall safety and is available in two thicknesses to match the fall heights of most play equipment (1.75" & 2.5"). This package of 40 tiles covers a 160 square foot area. When kids play, they also fall, and that's where PlayFall comes to the rescue. PlayFall Rubber Playground Safety Surfacing is designed to meet the stringent ASTM requirements for playground fall safety and is available in two thicknesses to match the fall heights of most play equipment (1.75" & 2.5"). 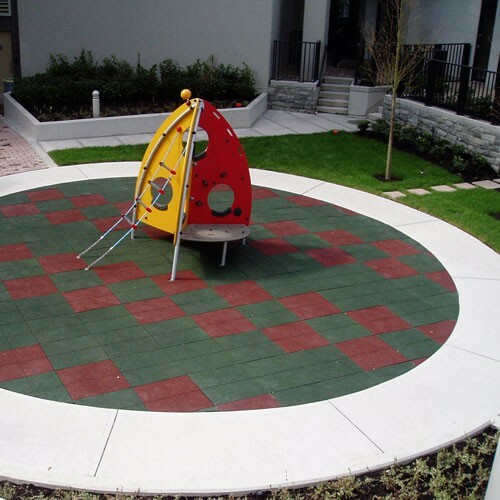 Created from recycled rubber, PlayFall Playground Saety Tiles are durable, resilient and porous to allow free drainage, and available in three different colors. Tiles connect using an interlocking pin system for safe play and easy installation. Green friendly tiles made from recycled rubber! Includes interlocking pins and two tubes of adhesive. Additional adhesive sold separately.